Dave Shealy's Skunk Ape Research in the News, May is Skunk Ape mating Season. Every May like clockwork, Dave Shealy gets in the news. Is it because of mating season? After blogging about Bigfoot news, you start to see patterns. The Kemerovo Yeti pops up in November and Skunk-Ape mating season begins in in May. This year Dave Shealy does not mention the Skunk Ape May mating season and usually we hear from him through Wireless Flash - FlashNews. But it is May and we did hear from Dave. For years, there have been rumors and reported sightings of an unknown mysterious creature lurking in the woods and wetlands of Florida. The legend only grew with photos sent to our local sheriff's office more than a decade ago. Most people know the names Bigfoot, Sasquatch, and Yeti. But in Florida, the human-like hair-covered creature has also been called the Skunk Ape. The National Parks Service says it is only a myth. However, sightings date all the way back to Native Americans. Today the legend is fiction for most and fact for a few. And down the Tamiami Trail, deep into the Florida Everglades, is a man who says there is even more proof. "I am the expert; the state and county expert on the Florida Skunk Ape, and have been for years." Dave Shealy runs what's he calls the Skunk Ape Research Headquarters in Ochopee. It doubles as a roadside attraction where you can check out snakes, buy a t-shirt, and hear one whopper of a tale. "In July 2000, I took these photographs. We have between 7 and 9 of these things that live in the Big Cypress Preserve." Shealy says the foul-smelling man-beast is real. In addition to the time he capture "it" on video, he says he's had two other encounters and hears new stories all the time. "There is just no reason to believe they are not real. The photos are pretty clear actually." There are also some photos taken on the Suncoast that Shealy says may back up his story. In the year 2000, two snapshots were sent anonymously to the Sarasota County Sheriff's Office. The person writing the note saying the animal came back numerous nights and they thought it was an escaped orangutan. "Honestly it looks like an orangutan. They actually have clear layovers and set on top it looks like an orangutan." Shealy believes it could be the creature he's been studying. "The ones I have seen have much shorter hair than what is in the photos. I believe that the photos are real." What are the odds of an actual ape-like creature living in the Everglades or anywhere in Florida? Very high; there are some living in Wauchula. "The Center For Great Apes is a sanctuary for orangutans and chimps." Patti Ragan runs the center, which is not open to the public. It’s home to 35 great apes, including one named Bubbles once owned by famed musician Michael Jackson. "The temperature actually in Florida is conducive; this is a tropical climate, which is why the sanctuary is located here." Shealy believes the creature has been raised in Florida for generations with plenty of ways to survive. "Pretty much everything you see here is edible. The Everglades is a virtual smorgasbord." It is true though that monkeys are becoming more familiar to Florida. In Central Florida near Silver Springs, a group of Rhesus monkeys have spread to what some say is more than 200. "A group of them got loose. They had a community already. They started to reproduce, now it is a huge community I believe along that river," says Ragan. Her opinion of the Myakka photos? "I look at that as a costume." Ragan says there are more real problems for apes -- like the harvesting of palm oil overseas -- facing these very real creatures. "There are so many orangutans and chimpanzees and other great apes that are in the wild being slaughtered right now. Not in the wild in Florida. Not some mythology that is running around in the Everglades." 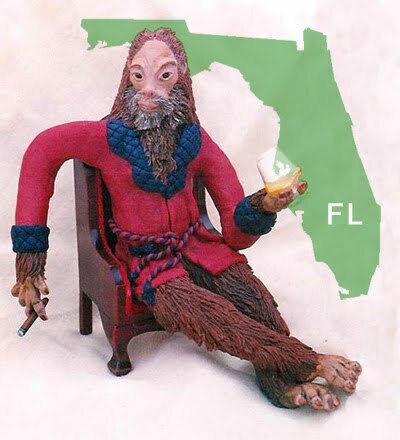 As for Dave and the Skunk Ape, the legend will likely live on -- even if the Skunk Ape doesn't...or does it? "It has really been a long time since somebody asked me if it's a guy in a gorilla suit. In the beginning, there were a lot of doubters, but these animals are real." There is a group called the Big Foot Field Researchers Organization. They actually have local people who look into sightings across the nation. Their website has a few stories from our region. You can also find information on the Center For Great Apes in Wauchula. All of those very real animals are there because they were abused or could no longer be cared for. You can even find Dave Shealy's research on the Skunk Ape at www.skunkape.info. Copyright 2012 Southern Broadcast Corp of Sarasota All rights reserved. This material may not be published, broadcast, rewritten, or redistributed.